Acute coronary syndrome, Left ventricular dysfunction, Broken heart syndrome, Takotsubo cardiomyopathy. Takotsubo cardiomyopathy is an acute onset of left ventricular apical ballooning without significant coronary artery stenosis which mimics acute MI symptoms and its ECG findings. Most patients manage to survive and a complete and rapid recovery occurs, although there is the possibility of relapse . This syndrome was described by Satoh et al. and by Dote et al. Due to the hallmark bulging-out of the apex (in ventriculogram, the left ventricle takes on a shape resembling Japanese pots designed for octopus hunting), it was named Takotsubo [2,3]. Other common names include broken heart syndrome or transient apical ballooning. In 1991, several cases were reported in japan. Recently, 1-4 cases were presented in European and North American populations . Patients are usually postmenopausal women or individuals with acute emotional and physical distress . These patients also develop dyspnea, chest pain or pulmonary edema. There have been reports of progression to cardiogenic shock or ventricular fibrillation in some cases . Slight increase in cardiac markers is observed which is significant as compared to the extent of the akinetic area . The main presentation of the Takotsubo syndrome is transient and reversible left ventricular dysfunction occurring after severe emotional distress and/or physical stress without coronary artery stenosis. The exact stressors and pathogenesis are not fully understood. Various forms of left ventricular dysfunction including wall motion abnormalities such as midventricular ballooning and some areas of the apex have been reported. Also, there have been cases of reverse Takotsubo involving right ventricle . This disease is associated with sympathetic hyper-arousal, micro-vascular dysfunction, coronary arteries spasms and abnormal metabolism. It seems that excessive release of catecholamines plays a major role in the incidence of this syndrome . This paper reports on a patient who presented to the medical center with chest pain and dyspnea. Based on patient’s medical biography and laboratory results, she was admitted with Takotsubo diagnosis and treatment was initiated. The patient was a 46 year old woman without any history of heart disease, presented to the hospital with severe chest pain and dyspnea. She had no history of hypertension, diabetes and hyperlipidemia. She did not mention any history of smoking, alcohol use or drug allergy. She stated a history of hysterectomy 8 years ago. An initial electrocardiogram in emergency room showed sinus rhythm with heart rate of 75 (Figure 1). In ECG, Q wave in leads V1-V6 and reverse T wave in leads I, AVL and V1-V6 was evident. The patient was immediately transferred to the CCU and cardiac monitoring was initiated. In echocardiography, EF of 35% and apical akinesis were reported. Figure 1: Electrocardiogram at admission. BS: 86، BUN: 12، Cr: 0.7، Na: 137، K: 3.7، WBC: 8000، Neutrophil8: 85 ، Lympocyte: 13، Monocyte: 1، Eosinophil: 1، RBC: 3.96، Hb: 11.7، HCT: 31.5، Plt: 145000، MCV: 79.55، MCHC: 37.14، MCH: 29.55. Also, a positive troponin result was obtained. Cardiac catheterization was immediately devised. In LAD, reduced blood flow was observed in the distal section. Contrast agent was injected into the left ventricle which indicated hyperkinesia in the base and the apex. An EF of 25% was reported. Echocardiography and electrocardiogram were again performed one week after discharge. In echocardiography, EF of 55% was reported (Figure 2). Also, in ECG, reverse T wave in leads I, II, III, AVF and V3-V6 and increased QT interval were observed. Figure 2: Electrocardiogram one week after discharge. Takotsubo cardiomyopathy was first discovered by Satoh in 1990 in Japan . In 1991, it was named Takotsubo by Dote because the left ventricle takes on a shape resembling an octopus trap . Takotsubo cardiomyopathy is also called Stress cardiomyopathy . The prevalence of cardiomyopathy among patients with acute coronary syndrome is 1-2.5% and it occurs in almost 90% of postmenopausal women at age of 62-67 . Tsuchihashi et al. introduced 88 patients with this syndrome . Their study along with other research in this regard showed that this disease is more prevalent among women and is associated with emotional or physical distress in some patients . Lonn et al. showed that the onset of symptoms following emotional and physical distress was 26.8% and 37.8%, respectively . In the present study, the patient experienced chest pain without any history of heart disease after the death of her husband. Acute phase: elevated ST segment in chest derivatives (especially in V3 to V6) and I derivative, Q waves in chest derivatives (in 15% of the cases). Sub-acute phase: elimination of ‘Q wave’s reverse and deep T wave in precordial leads and I, II and AVL leads, and long QT interval (the highest rate in the day 3). Echocardiogram: in all patients, akinesis was observed in apical and medial segments of the left ventricle. Ventriculography: a unique apical ballooning of the left ventricle along with severe contractions in the left ventricular basal area. Coronary angiography: no major occlusion was evident in coronary arteries . In ECG, Q wave in V1-V6 leads and reverse T wave in I, AVL, V1-V6 leads were evident. In echocardiography, apical akinesis was observed. In coronary vessels angiography, a reduced blood flow of distal segment was observed in LAD. International Takotsubo society showed that in most patients, the anterolateral area is involved in patients with Takotsubo cardiomyopathy . Considering that this is rare condition, there are a limited number of articles reporting the cases with this disease. A reported case was a 71 year old woman with a history of depression under ECT therapy. She had received 10 sessions of ECT with unknown cause in previous 4 years. The patient was hypertensive and was using nortriptyline 25 mg, metoprolol 100 mg and amlodipine 5 mg. she had no family history of heart disease. In ECG before ECT, sinus rhythm with heart rate of 97 in minute, without any alterations in ST segment and abnormal T and Q waves were observed. Anesthesia with methohexital 50 mg and succinylcholine 50 mg was performed. 4 hours after ECT, the patient had chest pain. ECG findings indicated flattened T wave in AVL lead and weak progression of R wave in precordial leads. A positive TPi test was obtained and no coronary artery obstruction was seen in cardiac catheterization. Echocardiography indicated EF of 20%, left ventricular dysfunction and extensive apical aneurism. Blood pressure was adjusted using Angiotensin converting enzyme inhibitors. In follow up after 4 months, a normal EF in echocardiography was recorded. Thereafter, the patient received 19 sessions of ECT using osmolol, labetalol and nicardipine for blood pressure control and cardiac care . During treatment with ECT, increased blood pressure and heart rate is common due to release of catecholamines . Physical and emotional stress leads to coronary vessels spasm which results in the internal release of catecholamines directly responsible for Takotsubo cardiomyopathy. This was also the case in the present study. Main therapeutic actions in patients with Takotsubo cardiomyopathy include supportive actions. Due to the fact that the condition is rare, there is no consensus regarding pharmacotherapy in these patients. Beta blocker drugs are effective in response to abnormal increase of catecholamines . Urchida et al. showed that alpha and beta blockers play a major role in preventing stresses which cause cardiac dysfunction . In another study, a 34 year old woman with a history of asthma, hyperlipidemia, preeclampsia, obesity and migraine presented to the hospital two weeks after childbirth with nausea, vomiting and pain in right upper quadrant. She was admitted with cholelithiasis diagnosis and prepared for selective cholecystectomy. She mentioned allergy to Simvastatin in form of skin rash. She also had a family history of hypertension. BP of 130/74, HR of 67, RR of 16 and O2 Sat of 98% were reported in vital sign sheet. In ECG, sinus rhythm with normal cardiac axis, reverse T wave in I, II, AVF and V3- V6 leads and ST depression in II, III, AVF and V3-V6 leads and flattened T wave in V1-V2 leads were recorded. Echocardiography before surgery was normal. 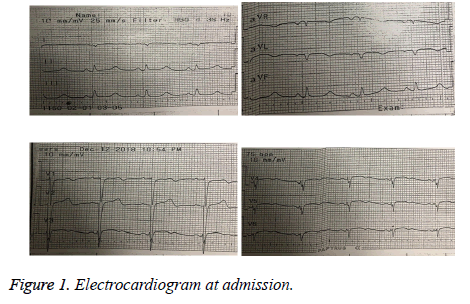 Low risk of acute coronary incident was considered in spite of abnormal ECG because the cardiac specialist believed that the patient was in optimal condition for surgery. In the operation room, the patient had severe chest pain and dyspnea complaint. Vital signs were as follows: BP: 213/141, HR: 140 and O2 Sat: 80%. ST elevation in I lead, AVL and ST depression in V4-V6 leads were observed and metoprolol was administered. The surgery was cancelled and patient was transferred to the CCU. TPi test was positive. ASA 325 mg, Osvix 600 mg and intravenous heparin were administered. Echocardiography was repeated which showed akinesia of posterior walls with normal coronary vessels anatomy observed in cardiac catheterization. Finally, Takotsubo cardiomyopathy diagnosis was confirmed . In the present study, a Takotsubo cardiomyopathy patient was introduced who experienced chest pain and dyspnea following an emotional stress without any history of heart disease. This type of cardiomyopathy is prevalent in postmenopausal years; therefore, this is a rare case occurring in a 46 year old premenopausal woman without any history of heart disease. After biography and diagnostic laboratory tests were recorded, Takotsubo cardiomyopathy diagnosis was confirmed and treatment was immediately initiated. Due to difficulty in early diagnosis, considering clinical symptoms and patient biography are very helpful at admission. Tsuchihashi K, Ueshima K, Uchida T. Transient left ventricular apical ballooning without coronary artery stenosis: a novel heart syndrome mimicking acute myocardial infarction. J Am Coll Cardiol 2001; 38: 11-18. Satoh H, Tateishi H, Uchida T. Takotsubo type cardiomyopathy due to multivessel spasm. Clinical aspect of myocardial injury: form ischemia to heart failure in Japanese. Kagakuhyoursonsya 1990; 56-64. Dote K, Sato H, Tateishi H, Uchida TIshihara M. Myocardial stunning due to simultaneous multivessel coronary spasms: a review of 5 cases. J Cardiol 1991; 21: 203-214. Sharkey SW, Lesser JR, Zenovich AG, Maron MS, Lindberg J, Longe TF. Acute and reversible cardiomyopathy provoked by stress in women from the United States. Circulation 2005; 111: 472-479. Ferrer Garcia MC, Ortas Nadal MR, Daga Calejero B. Chest pain and ventricular fibrillation in transient left ventricular apical ballooning in Spanish. Med Clin (Barc) 2004; 123: 38. Glockner D, Dissman M, Behrens S. Atypical acute myocardial ischemia syndrome with reversible left ventricular wall motion abnormalities (apical ballooning) without significant coronary artery disease. Z Kardiol 2004; 93: 156-161. Haghi D, Athanasiadis A, Papavassiliu T. Right ventricular involvement in Takotsubo cardiomyopathy. Eur Heart J 2006; 27: 2433-2439. Gianni M, Dentali F, Grandi AM. Apical ballooning syndrome or Takotsubo cardiomyopathy: a systematic review. Eur Heart J 2006; 27: 1523-1529. Roshanzamir SH, Showkathali R. Takotsubo cardiomyopathy a short review. Curr Cardiol Rev 2013; 9: 191-196. Ueyama T. Emotional stress-induced Takotsubo cardiomyopathy: animal model and molecular mechanism. Ann N Y acad Sci 2004; 10: 437-444. Wellens Hein JJ, Boudreau Conover M. The ECG in emergency decision making. London Elsevier Health Sciences 2005. Kawai S, Kitabatake A, Tomoike H. Guidelines for diagnosis of Takotsubo (Ampulla) cardiomyopathy. Circ J 2007; 71: 990-992. Celano CM, Torri A, Seiner S. Takotsubo cardiomyopathy after electroconvulsive therapy: a case report and review. J ECT 2011; 27: 221-223. Colson P, Ryckwaert F, Coriat P. Renin angiotensin system antagonists and anesthesia. Anesth Analg 1999; 89: 1143-1155. Prasad A. Apical ballooning syndrome: an important differential diagnosis of acute myocardial infarction. Circulation 2007; 115: 56-59. Uchida M, Egawa M, Yamaguchi S. Protective effects of emotional stress induced cardiac dysfunction depend on a/b ratio of adrenoceptor blocker. Circ J 2009; 73: 595. Craig Littlejohn F, Syed O, Ornstein E, Sander Connolly E, Heyer E. Takotsubo cardiomyopathy associated with anesthesia. Cases J 2008; 1: 227.